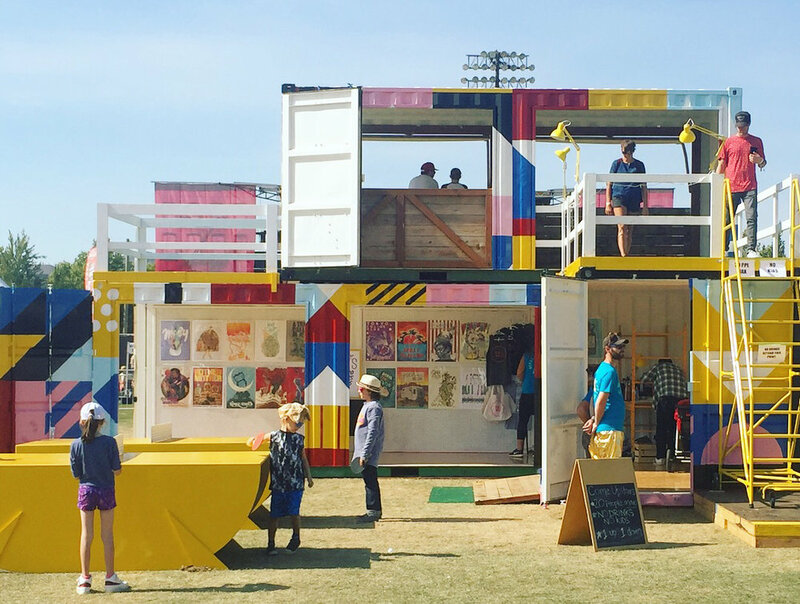 This project was directed by InterArts & Dockside Green in Victoria, BC and aimed to create a multi-level shipping container space to be used for artists, the community and events. With this in mind, we painted a bright mural to connect the units and bring them to life in a fun way for their first use at the Rifflandia Music Festival. At the festival, the structure became the literal high-point of the festival as it gave people a place to relax, chat and get a better view of the festival. Rifflandia Music Festival is a four-day multi-venue music festival held in Victoria, British Columbia. With no fixed date, the festival has occurred in the month-long span between the last weekend of August and the last weekend of September. Rifflandia was first launched on August 29, 2008. CARGO is a new space for creativity at Dockside Green's BETA site. From weekly MAKER'S MARKETS, to outdoor gathering space, to workshops, to exhibition opportunities, CARGO is being created as an accessible hub for Victoria's creative community. Rifflandia also includes Artlandia, the War Child Lounge, and publishes an annual magazine. Local brewery and sponsor, Phillips Brewery also produced a Rifflandia beer, Rifflandabrau, sold around the festival’s time. The festival is staged by a local production-company, Atomique Productions, and is sponsored by local businesses and various members of the media.